World of Architecture: 56 Leonard Street: "Construction Will Begin Next Week"
56 Leonard Street: "Construction Will Begin Next Week"
Finally! The construction of 56 Leonard Street is continuing after years of big "nothing". Tribeca's tallest went out in 2007 and after successful construction start, work has been halted because of financial situation. 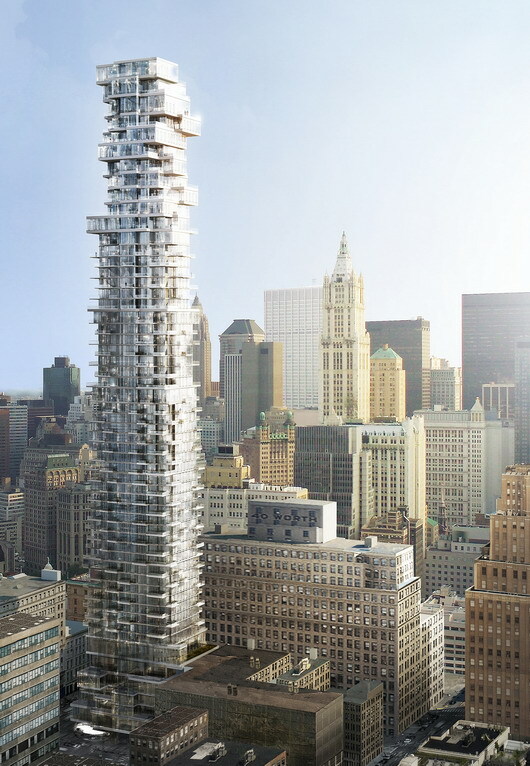 This 250m (821ft) tall piece of modern architecture is designed by Herzog & De Meuron and it's known as one of the most beautiful skyscrapers going up in New York since Art Deco masterpieces back in '20s and '30s. For more info about this beauty, check out our previous post with more photos and renderings. "But the concern now is the impact of construction on the surrounding neighborhood. Committee chair Peter Braus called it “shocking” that construction will last four years, including nearly two years for the facade alone. DelGreco said construction will begin next week on the north side of the site where workers will begin the three-month job of chopping up the sidewalk and putting in utility vaults for Con Edison. It will take more than a year-and-a-half, beginning in December, to build the superstructure, with facade work to start next July. The building is scheduled for completion in Spring, 2016." Stay tuned, we will watch this one closely. Update: Workers returned on the site, first construction update in 2013.